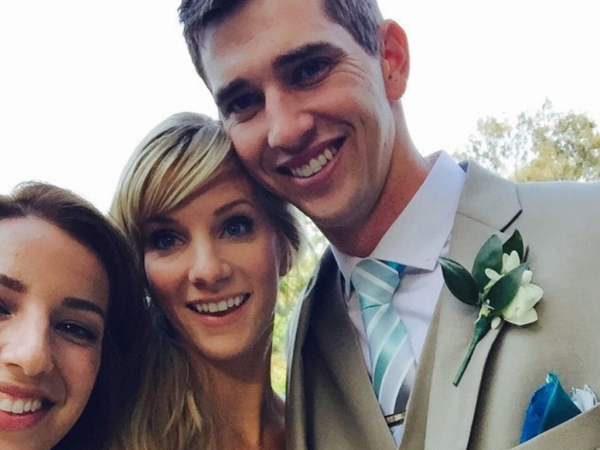 The Glee actress and her high school sweetheart Taylor Hubbell tied the knot yesterday, in a ceremony attended by friends, family and Heather’s Glee co-stars. Naya Rivera, Jenna Ushkowitz, Kevin McHale, Vanessa Lengies and Grant Gustin all helped their cast mate celebrate her big day. Vanessa, who plays Sugar Motta on the hit show, uploaded a series of snaps to her Instagram account. One was a selfie of her with the happy couple, captioned with the hashtag #thehappyhubbell. She also snapped a selfie of her and Kevin, both beaming into the camera. Vanessa posted a sweet photo of Naya receiving a kiss on the head from her husband Ryan Dorsey, who she married in July last year. Naya is currently expecting their first child. Another was a group shot from a photo booth, with guests pulling silly faces and wearing comedy hats and masks. Heather played ditzy cheerleader Brittany Pierce in the award winning musical show, which came to an end after six seasons earlier this year. The 28-year-old and Taylor welcomed their son Elijah in September 2013. "It's the Glee baby! And it's so wonderful and [Heather's] just glowing. And she's a mom!" Jenna previously gushed to E! News. "She takes such good care of him, it just makes you so happy and that's like our son, too. [Heather] looks great and she brought her baby to set and he's beautiful. And she's so happy and you know everyone's so happy to be back together again it's wonderful."